The Samsung SNO-7080R IR LED HD bullet network camera features 2048 x 1536 megapixel image sensor with dual streaming capabilities. This camera is ONVIF compliant and is capable of displaying multiple resolutions through to 16:9 format 1080p up to 3 megapixel (2048 x 1536). The SNO-7080R supports multiple H.264, MPEG-4 and MJPEG codecs to provide a high quality recording solution and seamless monitoring with its frame rates of 30fps. The SNO-7080R features motorised vari-focal lens and smart compression function to save installation time and bandwidth by capturing greater details only for the regions of interest. The Smart Compression where a predefined Region of Interest (ROI) or faces (Face detection) are compressed differently than the rest of the image making them clearer while maximizing bandwidth and storage efficiency. 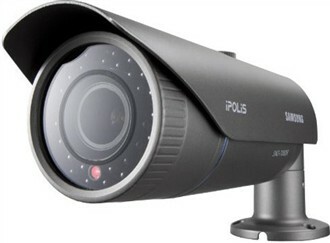 It also features 3-D digital noise reduction along with Video Motion Detection. The Samsung SNO-7080R has many exciting features for users of all types. See the Samsung SNO-7080R gallery images above for more product views. The Samsung SNO-7080R is sold as a Brand New Unopened Item.